Welcome back for Day 2 of Philip Livingston Weekend! Today we discuss Livingston’s journey from public servant to Revolutionary. A decade after the Albany Conference, the French and Indian War had been won. To pay for the war, new taxes were imposed which the colonists were not happy about. Philip Livingston, now a member of the Provincial Assembly, was chosen to represent New York at the Stamp Act Congress. The Stamp Act Congress sent letters to the King and Parliament asking for a redress of grievances and several historians (most notably me) view this meeting as the beginning of the American Revolution. Philip continued to serve in the Provincial Assembly until it was dissolved by the Royal Governor. He became a member of the Committee of Fifty-One, a group of merchants who basically set up a shadow government for New York (as was happening throughout the colonies and usually referred to as a Committee of Correspondence). The Committee of Fifty-One chose New York’s delegates to the First Continental Congress. And who did they send? None other than Philip Livingston. To be fair, several other New York delegates joined Livingston in the Continental Congress. They signed the Continental Association, which declared a boycott of British goods and asked the King to correct the wrongs of Parliament. Livingston returned the following year for the Second Continental Congress where he was a signatory of the Olive Branch Petition. This was one last plea for peace with the King (though war had already broken out at Lexington and Concord and George Washington was on his way to Boston to take over as Commander-in-Chief of the newly formed Continental Army). Philip stuck around for another year and voted to separate from Britain in July of 1776. That August, Livingston was present for the signing of the Declaration of Independence. When the British occupied New York City they took over Livingston’s two homes. One was used as a hospital, the other as a barracks. Unfortunately, Philip would not be able to reclaim his properties after the Revolutionary War. Long fighting ill health and now in his 60’s, Philip Livingston died while the Continental Congress was holding session in York, PA. In honor of their fallen compatriot, the other Representatives shut down the Continental Congress for a day to attended his funeral. They made an official declaration that June 1778 was a month of mourning in memory of Philip Livingston. To read about other Declaration Signers whom you may never have heard of, check out these articles on John Hart and Lyman Hall. 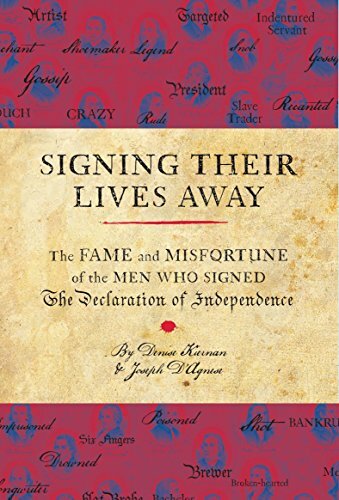 For a nice table read that covers the bios of all the Signers, check out ‘Signing Their Lives Away.’ It contains brief biographies not too different from what you usually find on this site. Pick it up through the affiliate link below. If you like what we do here, make sure to sign up for our daily emails so you never miss a Founder.